Cox & Kings’, Head of Relationships and Supplier Management, Karan Anand has been conferred with the prestigious Gold Medal for Tourism (Médaille d’Or du Tourisme) by the French government in recognition of his contribution to tourism. 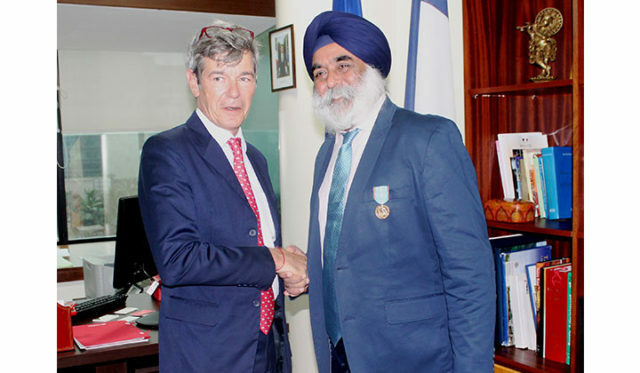 Karan Anand received the award during a special ceremony hosted at the French Consulate in Mumbai. This is the first ever Gold Medal given by the French government to an Indian from the tourism industry. France has always been an aspirational destination for the savvy Indian traveller and Cox & Kings has been one of the pioneers in opening up attractions and destinations to suit the Indian traveller. Among the notable achievements, the leading travel group has been the first one to serve Indian cuisine at the Lido, facilitate exclusive tie-up with the Grevin Wax Museum, introduce ParcAsterix—the amusement park, opened Bordeaux for wine tours and successfully open the Charmonix Mont Blanc region to the Indian market. Anand in his advisory role with Atout France has consistently played a key role in advising the French tourism industry on the dynamics of the Indian market and to harness the potential that lay in store. Sheetal Munshaw, Director, Atout France, explained, “We are absolutely elated that Anand is the first Indian recipient of this prestigious gold medal in tourism conferred by the French Republic. Anand has been a great friend of France for several years and has actively contributed to the evolution of tourism to France. He has lent his expertise consistently and has over the years willingly extended his unwavering support to showcasing destination France in his capacity as a member of the Advisory Board for Atout France. Our association with Cox and Kings has resulted in many innovative promotional programs showcasing the myriad experiences France has to offer. The role of Cox and Kings in introducing new destinations such as Chamonix Mont Blanc, the Grevin Wax Museum in Paris has been instrumental in our showcase of France. In 2016, a joint collaboration resulted in the creation of a first-ever gastronomic brochure dedicated to France which perfectly celebrated the versatile flavours of French cuisine”. The Gold Medal for Tourism (Médaille d’Or du Tourisme) recognizes individuals, whether French or non-French, who have contributed effectively to the development of tourism and related activities through their voluntary contribution or professional value and in strengthening bilateral relations.